We can offer support to Building Companies on an ad hoc basis or on a continual programme. Our experience lies on both commercial and domestic sites and includes windows from Single Houses to Large Residential Developments, Apartments and Apartment Blocks through to Retail Units and Shopping Centres, Industrial Units and even entire Industrial Estates all designed around our clients needs. You can now engage a single contractor with the knowledge and experience to effectively take care of all of your industrial cleaning problems. All of our operatives have gone through their CSCS course for occupational competence. Our services include Builders' Initial Cleaning, house and apartment re-cleaning following snagging, weekly show-house re-cleaning, site-office and canteen cleaning. We work closely with the Site Managers and maintain strong communication throughout. AYS management will ensure that all operatives will be aware of their responsibilities towards Health and Safety, we are able to produce site-specific Method Statements and Risk Assessments, we are CIS registered and our operatives are fully equipped with the necessary PPE. 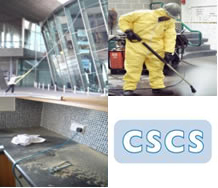 AYS have managed the cleaning responsibilities for large international companies through to smaller shop fitters on either an on going basis or as a one off clean.